That's one less modernist stained-glass window! Pic courtesy of Br. Peter Hannah, O.P. Meet the Rev. Br. Peter Junipero Hannah, O.P., transitional deacon, who we hope will be one-sixth of the future founding fathers of Idaho's first Dominican priory. The Bl. Margaret of Castello chapter just had Br. Peter come here and give us a world-class retreat, along with Fr. Vincent Kelber, O.P., whom we'd like to have as another Idaho one-sixther. Despite the fact that it was late July, with temperatures at over 100, and our swamp cooler was not working very well, Br. Peter gave us conferences in full habit, including the heavy black cappa and capuce. His talks were so good that he did not require the club to guarantee our undivided attention. But Br. Peter wasn't always aware of a religious vocation, or on the track to the priesthood, to which he will be ordained next May. He didn't even start out as a Catholic. 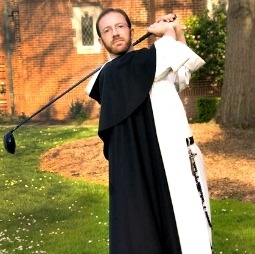 His prime ambition before entering the Catholic Church was...golf! Read the whole story of how God plucked Br. Peter Hannah from the fairway and set him in The Way here.